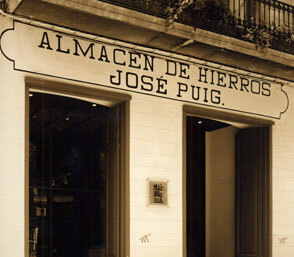 The Puig Infante Group was founded in 1869 by Josep Puig Corominola. Since then, the iron commercialization and industrial hardware products supplying are the main areas of the business. Since its beginnings until today the Group Puig has evolved and has been modernized to offer the best products to their customers in each of the different business units. The historical store located on the Rambla de Girona moved in 2010. And was together with the premises at Ciutadans Street, in the same city, the old warehouse where the big iron pieces were stored. These two businesses were the origin of the current company. Today "Ferros Puig" brand, stores and sells steel products with European stimulation. "Ferreteria Puig Industrial" offers solutions for companies and autonomous for maintenance and various jobs. For non-professional customers who seek solutions for home, "Brico Puig" is close to the client with the shop in the center of Girona city. The Grup Puig Headquarters are located in Fornells de la Selva (Girona). Company dedicated to the storage and distribution of steel products. Wholesaler of industrial supplies, with 10,000 m2 in Fornells de la Selva, Figueres and Barberà del Vallès. Retail commercialization of articles of DIY products, gardening and household hardware to the non-professional client.